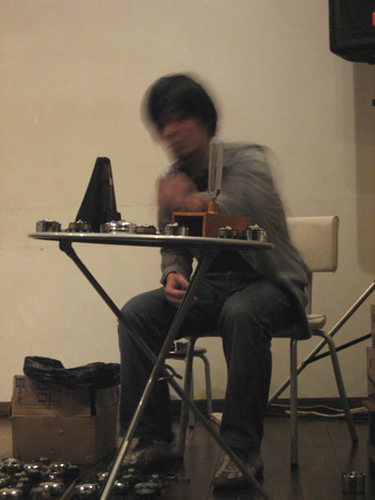 Born in Osaka, 1980.In 2000, Kawaguchi started thinking about field recordings. His interest lies not in the kind of field recordings that focus on sound tones obtained in the field, but on the configuration of sound in a specific space. He creates recorded works using sound-making objects, presents installations, and is active in the field of improvised music. He plays solo performance, installations, and the member of following groups, Hello (Shinjiro Yamaguchi, Satoshi Kanda, and Takahiro Kawaguchi) / Off Cells (Seiijiro Murayama, Taku Unami, Utah Kawasaki and Takahiro Kawaguchi) / Akibin Orchestra (Masafumi Ezaki’s orchestra for empty bottles).